PAGASA issued weather forecast, update No. 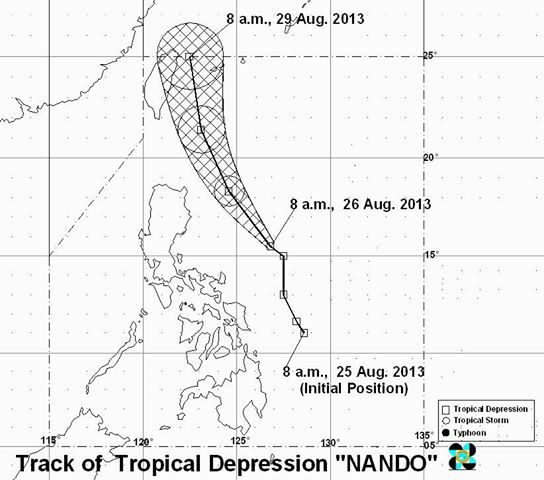 3 today at 11:00AM (August 26, 2013) for Typhoon 'Nando'. Bagyong “NANDO” has maintained its strength and is now moving in a northwest direction. "Typhoon NANDO” is expected to enhance the Southwest Monsoon (Habagat) which will bring light to moderate rains and thunderstorms over Southern Luzon including Metro Manila, and over Western Visayas. The location of center at 10:00 AM today of Typhoon or Tropical Depression “NANDO” was estimated based on all available data at 480 km East of Baler, Aurora (15.7°N, 126.6°E). "Nando" has maximum sustained wind strength of 55 kph near the center. It is forecast to move Northwest at 15 kph. Tropical Depression “NANDO” is expected to be at 270 km East of Tuguegarao, Cagayan tomorrow morning and at 150 km Northeast of Basco, Batanes by Wednesday morning. By Thursday morning, it is expected to be at 460 km North of Basco, Batanes or at 40 km East of Northern Taiwan. Public Storm Warning Signal (PSWS # 1- winds of 45-60 kph is expected within the next 36 hours): Batanes Group of Islands and Cagayan including Calayan and Babuyan Group of Islands. Estimated rainfall amount is from 5 – 15 mm per hour (moderate - heavy) within the 400 km diameter of the Tropical Depression. Sea travel is risky over the eastern seaboard of Central and Southern Luzon. The public and the disaster coordinating councils concerned are advised to take appropriate actions and watch for the next bulletin to be issued at 5 PM today. In a weather update at 11:30 AM, yesterday, PAGASA said that Tropical Depression 'Nando' has developed from Low Pressure Area (LPA) at East of Dinagat Island. In a rainfall advisory issued at 10:24 AM today, PAGASA said that rainfall advisories for Mindanao are now terminated. Meanwhile, thunderstorm is more likely to develop over Metro Manila within 12 hours. All are advised to monitor for updates.